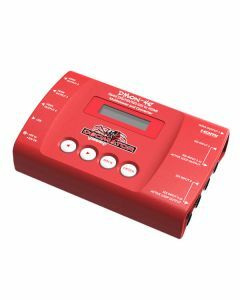 The DMON-4S is a truly portable converter, that incorporates a new easy to use LCD and button control system. This gives you easy access to all of the amazing features without using complicated LED/button control, dip switches or having to carry around a computer to change a simple setting. The Decimator Design DMON-4S converter, with quad multi-viewer functionality, successfully condenses four independent SDI to HDMI converters into a tight, on-location friendly package. The DMON-4S empowers the user to convert four separate SDI streams to either four independent mini HDMI outputs, or combine them into a quad-split HDMI output. The converter supports SD, HD and 3G-SDI formats and is capable of automatically detecting the quality of any input signal. The built-in LCD info screen and button controls also provide the ability to set output options without resorting to DIP switch settings, or connecting the unit to a desktop workstation. Decimator Design’s DMON-4S can be set to one of several conversion options. From four SDI inputs to four HDMI outputs, four SDI inputs combined into a quad-split HDMI output on one, or all four of the HDMI outputs. It’s also possible to set the unit to translate two SDI inputs to HDMI and use the other two SDI inputs as loop through outputs. From quad-split mode, you can assign the audio from any input to be deployed as the audio for every output. A threaded locking power socket assists in the prevention of accidental power loss from kickouts and the like.